For the first time in nearly 30 years, athletes will represent Juneau at the Native Youth Olympics, which will open Thursday in Anchorage. Ten middle and high school students from Juneau will vie in competitions, including the Alaskan high kick, Eskimo stick pull, one-foot high kick and the seal hop. The athletes who qualified for the team are Joe Dundore, Derrick Roberts, Josh Sheakley, Erick Whisenant, Bryan Johnson, Kalila Arreola, Arthur McVey, Matthew Quinto, Trinity Jackson and Skylar Tuckwood. While athletes train to compete, NYO games differ from other sports in that cooperation and collaboration are key tenets. Even competitors help each other, as historically this was an important survival skill, said Coach Kyle Kaayák’w Worl, a veteran of the games who has won many medals. The games will take place Thursday through Saturday, April 26-28, at the Alaska Airlines Center, University of Alaska Anchorage, in Anchorage. The event will be streamed live at http://bssd.org/. ​The Native Youth Olympics is a statewide sport that includes 10 different events or games to test skills of strength, agility, balance, endurance and focus. These games are based on hunting and survival skills of the indigenous people of Alaska and across the Arctic going back hundreds of years. Each year, teams of high school and middle school athletes from across the state travel to Anchorage to take part in the Sr. Native Youth Olympics. More than 500 athletes from over 100 communities, split into male and female division, compete for 1st-5th place medals in the 10 events. Athletes strive to perform at their personal best while helping and supporting their fellow competitors, no matter what team. This is the spirit of the games, to work together toward common goals and learn from the skills and values that allowed Alaska Native people to survive and thrive in some of the harshest conditions. The event is produced by Cook Inlet Tribal Council. Juneau’s NYO team is a community collaboration made possible by the support of Sealaska Heritage, Central Council of the Tlingit and Haida Indian Tribes of Alaska, Goldbelt Heritage Foundation, Juneau School District’s Indian Studies Program, University of Southeast Alaska Wooch.een Club, Juneau Tlingit & Haida Community Council, Alaska Native Sisterhood Camp 70, Alaska Native Sisterhood Camp 2, Alaska Native Brother-hood Camp 70 , and the Bering Strait Regional Corporation. Special thanks to Trickster Company for designing the team uniforms and medals and providing prizes at events. Thank you to everyone who contributed to the success of this project through donations of time, food, housing, and other community support. 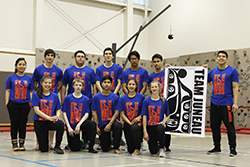 If you would like to donate to the Juneau Native Youth Olympic Team please make your tax deductible donation at http://www.sealaskaheritage.org/donate. CONTACT: Amy Fletcher, SHI Media and Publications Director, 907.586.9116, amy.fletcher@sealaska.com; Kyle Worl, Coach, 907. 227.4998, kyle.worl@gmail.com. Caption: back row: Coach Kaytlynne Lewis, Joe Dundore, Derrick Roberts, Josh Sheakley, Erick Whisenant, Bryan Johnson, Coach Kyle Kaayák’w Worl; front row left to right: Kalila Arreola, Arthur McVey, Matthew Quinto, Trinity Jackson, Skylar Tuckwood. Photo by Brian Wallace, courtesy of Sealaska Heritage Institute. For a high-resolution image contact Kathy Dye, kathy.dye@sealaska.com or 907.321.4636.